For corporate and industrial concerns, we can build a package tailored to suit your company's needs and requirements. This may include site visits, hearing tests, an HSE recommended report, production and fitment of custom hearing protection for your employees. They are suitable for industry and factory use. When used in the food processing industry, a 3mm stainless steel ball bearing is bonded into the earplug to make the earplugs metal detectable. We have a product which not only delivers significant in-built cost-savings compared to single use protectors, but also provides excellent noise suppression specifications. Having surveyed a medium-sized company for hearing protection needs, we were able to demonstrate an overall cost saving in the order of £40K over a five year period. Break even cost achieved at 8.5 months! In excess of £39K cost saving over 5 years! Achieved with a more comfortable, hygienic and practical product! Delivers greater workforce compliance with HSE regulations! 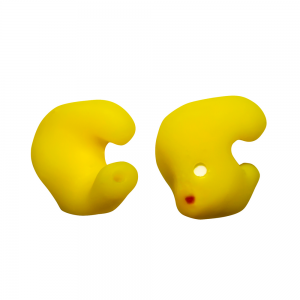 These custom moulded soft silicone earpieces are individually crafted under the strictest conditions from an exact impression of the user’s ears. Each pair is manufactured using specially formulated medical grade silicone, to the highest degree of comfort whilst providing a highly effective acoustic barrier. These are available in yellow, flesh, blue or transparent colours. Connector cords and lapel clips can be fitted as an optional extra. CE marked & tested to EN 352-2:1993, SNR:29.